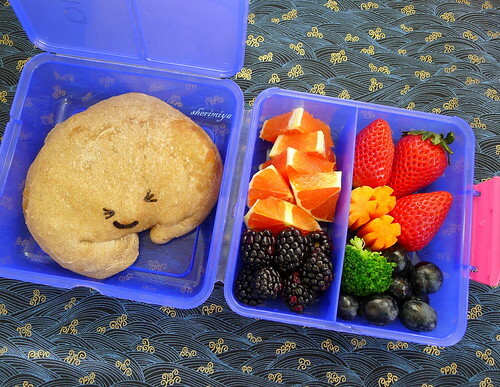 Chubby Calzone Bento, a photo by sherimiya ♥ on Flickr. It's calzone day today - filled with pepperoni, ham, mozzarella, and arugula - and I didn't take the time to make any particular shapes but when they came out, I thought they looked like chubby crabs. So I added a scrunched face and that's what we're calling it. Luckily MisterMan's fit inside his Sistema box perfectly. I like this box for calzones because the sections are pretty tall and can accomodate a chubby calzone very well! The other section contains cara cara oranges, blackberries, strawberries, carrots, broccoli and grapes. Cute! I love the variety of fruits and vegetables you put into your bentos. ^^ I especially love your carrot flowers! Thanks Aiko -- we're lucky to have lots of fresh produce in CA even in winter. I choose the colorful ones for special interest; otherwise it's just apples and oranges. HAHA! Looks like he's trying reaaaally hard at somethin'. ; ) I'd open up this bento lunch and smile and laugh.. and have a really happy lunch! Lovely fruit section and I recognised it as cute chubby crab on the flickr thumbnail, so no doubt about that. That's good to know, great! Chubby and sweeeet little guy! Has me in smiles!